One of the best forms of CPD I’ve ever received have come directly as a result of becoming an Apple Distinguished Educator (ADE). If you’re using Apple technologies in your everyday teaching practice and doing some amazing things as a result, then this is one professional learning network that you should be trying to become a part of. 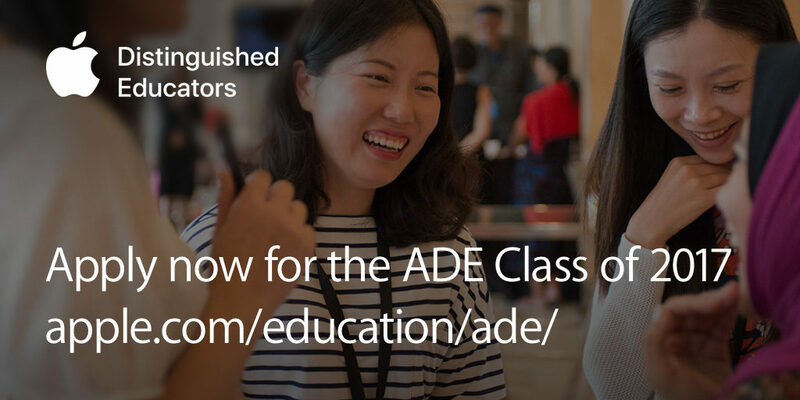 If you are selected to become an ADE you will not only join the most amazing group of inspirational educators but you’ll gain insights and connections with Apple and training that is simply world class. On the page you will find information on application requirements, eligibility, and dates for the required ADE Academy in your country. Apple have also provided details to guide you on creating your 2-minute application video. Share how you have transformed your learning environment to engage learners. How have the Apple products you have access to uniquely helped you achieve your learning goals? Share data or new learnings that provide evidence of the impact you are making. Are there examples of student work or innovative strategies that you can highlight? So far in this post I have only really shared with you things that you could find out pretty easily for yourself. 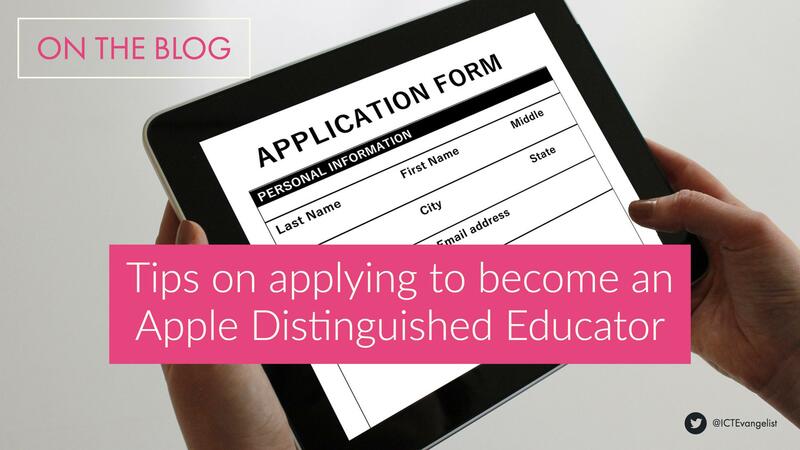 The post is clearly titled “My tips on applying to become an Apple Distinguished Educator” so with that in mind here are my top tips on applying to become an ADE. Being an ADE isn’t about how many iPads you have in the classroom, it is about your work both inside and outside of the classroom. If I take any ADE as an example, let’s say Steve Bambury from the UAE, a teacher at the Jumeirah English Speaking School (I chose Steve as he is someone I now know well through the ADE network and someone I have had the pleasure of meeting and working with on a number of occasions). Steve can clearly show through his practice how he has hit all three of these target areas. He not only does great work with Apple technologies in his classroom but he has clear evidence of success with the great work his pupils create and the learning that takes place. In addition to that, having worked at his school previously at the JESS Summit I know from speaking to his colleagues the impact that he has had on their work in the classroom too. When you couple all of those things to his work on his website that he runs with friend, colleague and ADE Luke Rees on the iPad Educators website you will get a grasp of the kind of educator that gets to become an Apple Distinguished Educator. Don’t be scared if you aren’t engaging on the kinds of levels that Steve is though. Whilst a competitive process as spaces are limited, it is not about how many followers you have on Twitter or how many iPads you’ve got it is about you and your practice. So show what you do! There is no point in trying to be someone you’re not. There may be someone that you look up to that is already doing great things in their classrooms. Don’t try and be them. Be yourself. Your story and your impact is what is important, not what someone else is doing in their classroom or on social media or anywhere else. Show what you have done. It will sing through in your video, in your choice of images, audio and of course your voice. I took photos of me working with children, adults, others, at Teachmeets, screenshots of my website, Twitter feed, so forth and so on to be my visual evidence. You know how you give children the syllabus or a mark scheme so that they know precisely what the exam board want? You have this from Apple. Make sure your words match the requirements and are obviously true – the visual record should reflect what it is you are saying. If there’s one thing that is common amongst ADEs, it is their passion for education. Try to make that shine in your application. If I think back to my application back in 2012 for the 2013 cohort, whilst my evidence was strong and my video too, looking back, my voice couldn’t have been much more monotone. Show your passion! Share you story. If there’s one thing that Apple love as much as technology it’s stories. Share yours. This is an application to become an Apple Distinguished Educator. Don’t leave your success to chance. Make sure your SPAG is correct. I always use Apple products to showcase what I do. For example, for my application I used my Mac, I took photos on my iPhone and I wrote a theme tune using GarageBand to go in the background. Ok, so you’ve read this blog but I certainly don’t know everything! Check out the #ADEchat hashtag. The ADEchat hashtag trended at Number One on Twitter this week. That will give you some idea of the passion of existing ADEs to join in but also the volume of people wanting to become ADEs looking to learn from the experience of others. This year more than in any other year, ADEs have been turning to Twitter and sharing their ideas on what a good one looks like. We don’t know what the judging criteria are unless we are on one of the judging panels of course, but we all have our own individual stories to tell. Get in touch with some ADEs that you know (or don’t) on social media or in your local networks and ask them for their advice! In this spirit of sharing too, for the first time ever I will share publicly my original ADE application to give you a flavour and maybe some ideas to help you too. I hope the post helps and I wish you all the very best of luck in your applications! DON’T FORGET THAT THE DEADLINE FOR APPLICATIONS IS 15 FEBRUARY 2017!! !